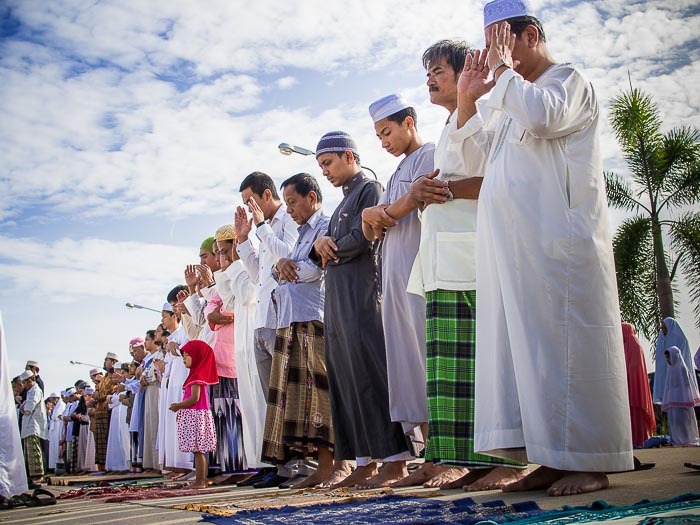 Men pray in front of the Songkhla Central Mosque near Hat Yai on Eid al-Fitr. I went to Songkhla for Eid al-Fitr, one of the most important holy days in the Muslim calendar. It marks the end of Ramadan, the holy month of fasting. Ramadan is the most important month on the Muslim calendar. In the west, we think of it as the month of fasting - when Muslims don't eat or drink from sunrise to sunset. But it's really a lot more than that. It's a time of restraint and prayer, so there should be no gossip or backbiting (restraining the mouth), there should be no taking what's not yours (restraining the hands) or looking at inappropriate images (restraining the eyes). The idea of "fasting" goes well beyond eating or drinking. Drinking in this case refers to water, tea, juice etc since devout Muslims are not supposed to drink alcohol under any circumstances. 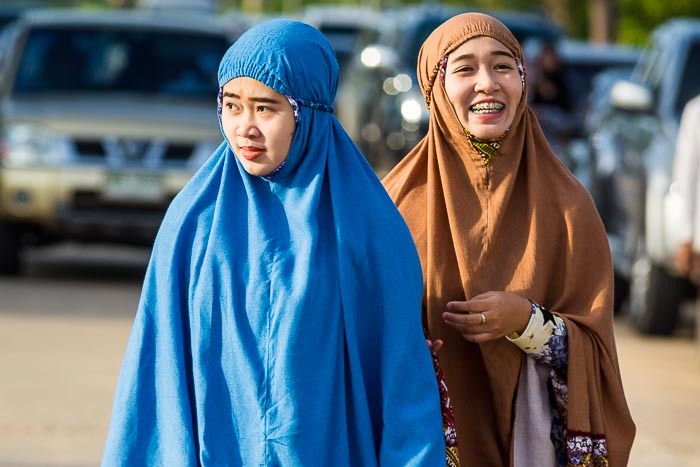 Women walk to the Eid services at Songkhla's Central Mosque. Prayers for Eid are usually offered in large halls or open fields. Because it's a time of coming together, many mosques aren't big enough to accommodate to crowds. In Songkhla, people gathered in the street in front of the mosque and spread out their prayer rugs. 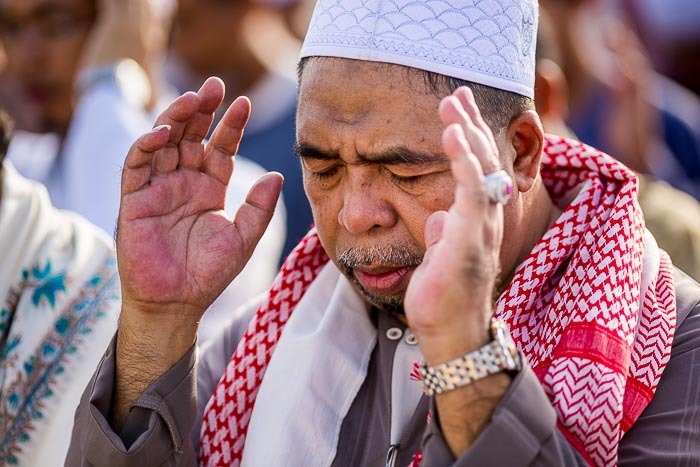 The muezzin makes the "call to prayer" and people pray. Men and women pray separately. In mosques, there are separate rooms (or a screened off area) for women. At the Songkhla mosque, the women also prayed in the street but behind the men. A man prays during Eid service in Songkhla. After the service children play games and are given small gifts, usually sweets and a small amount of cash (in Songkhla it was 20Baht, about .60¢ US). Men greet each other after Eid prayers. 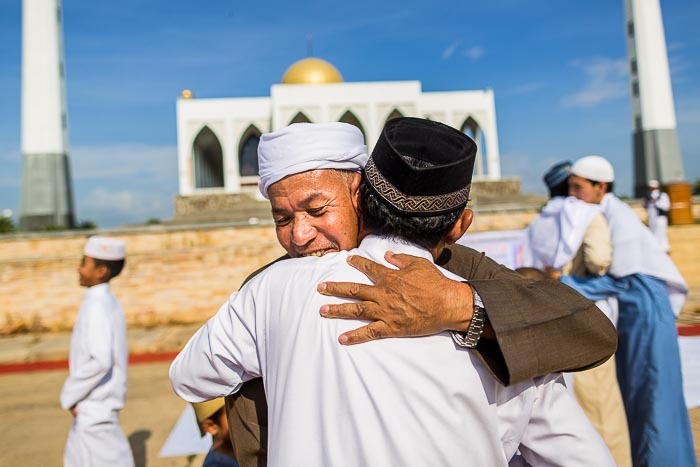 There are more photos from Eid in Songkhla in my archive or available from ZUMA Press.